Come the New Year, those seeking to improve their overall health generally start with new fitness and diet resolutions. Some may think that getting healthier means strict calorie reduction for weight loss, or exercising to the point of fatigue. In reality, the path to good health is measured by proper nutrition and hydration, as well as physical fitness. 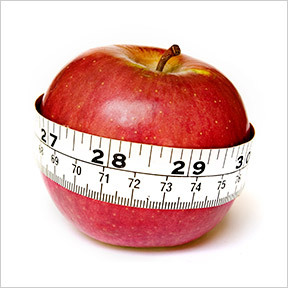 Even those at a healthy weight may be making poor nutritional choices that can negatively affect long term health. Those who follow a satisfying exercise session with an unhealthy meal are less likely to improve their body composition or meet their training goals. Good intentions often fall prey to busy schedules and commitments, leaving one to resort to processed or convenience foods at the expense of good nutrition. Eating a well-balanced diet provides the body with the nutrients required for good cellular health and function. When even the thought of a “diet” makes you uneasy, it may be that the word itself implies denial and hunger. In some instances, it’s used to describe low calorie commercial foods like diet soda. In reality, it more accurately describes a reduction of daily calories for weight loss or weight management. If you believe that dieting has too many rules, or believe you can overindulge as long as you do a little more exercise in an attempt to negate the added calories, it helps to remember just one thing—you can never outrun a poor diet. Some healthy diets are easier to follow and stick with over the long haul. Some don’t supply adequate nutrition to support healthy bodily functions. It’s the avoidance of nutritional deficiencies, not calorie counting, that one should be most concerned about. Consuming healthy foods in the right amounts provides the energy your body needs for proper function and wellbeing. Improvements to the daily diet are associated with longer, healthier lifespans, as well as decreased risk of many chronic diseases. Many popular diets have common elements that are proven beneficial to heath, but no single one is clearly proven to be the best. However, Dr. David Katz, a practicing physician and researcher at Yale University’s Prevention Research Center states, “A predominately plant-based diet of minimally processed foods close to their natural state is positively associated with health promotion and disease prevention.” In other words, focus on real foods for energy production and long-term health. A healthy diet is one that helps maintain and promote overall health and provides essential nutrition, including proteins, complex carbs, essential fatty acids, fiber, vitamins, minerals, and fluids. A focus on healthy, nutrient-rich foods can keep hunger at bay, minimize cravings, and help maintain healthy blood sugar and hunger hormone levels. Spending some time on food prep at home relates to better eating habits and healthier meals, especially when you choose recipes you can double or triple to use the next day or freeze for a night when you can’t find time to cook. While some focus on healthy eating 80% of the time and save 20% for splurges, perhaps try eating more mindfully until you’re 80% full, which can help prevent overeating. The World Health Organization describes good nutrition as a well-balanced intake of food, considered in relation to the body’s dietary needs. Further, poor nutrition can lead to reduced immunity, increased susceptibility to disease, impaired physical and mental development and wellness, and reduced productivity. Remember that your daily food choices affect how you feel today, tomorrow and in the future. Research shows that the most successful motivation for sticking to a healthy lifestyle is not weight loss, but rather improved physical and mental health, as well as higher self-esteem. If you’re unsure what to eat, you can’t go wrong with a balanced plan that includes protein, complex carbs, healthy fats and a wide variety of colorful fruits and vegetables. While you don’t have to make drastic changes overnight, for better long-term results, begin by improving both your nutrition and your activity level. Nutrient 950® with NAC by Pure Encapsulations®: This complete hypoallergenic, nutrient-rich formula provides highly bioavailable vitamins, minerals, antioxidants, and cofactors for optimal nutritional support of all bodily systems. Gluten and soy free, Non-GMO vegetarian formulation. Nutritional Flakes, Q. by Quantum Nutrition Labs: Suitable for daily use, this product provides an ideal source of high quality, bioavailable vegan protein containing essential and non-essential amino acids, as well as additional B vitamins. No artificial ingredients. SeroPlus by Pure Encapsulations®: This product supplies neurotransmitter precursors to help maintain healthy serotonin activity to promote relaxation, moderate occasional stress and support healthy eating behavior. Gluten free, Non-GMO, hypoallergenic, vegetarian formulation. PaleoReds™ by Designs for Health®: This professional whole food formulation provides high quality, antioxidant-rich, nutritionally dense fruits and vegetables in powdered form. Natural strawberry-banana flavor, 70% organic ingredients, and nothing artificial. Get Healthy Greens by Prescribed Choice: This hypoallergenic, easily digestible, whole food drink mix provides a wide variety of nutrients to support cellular metabolism, increased energy levels, normal intestinal health and superior antioxidant protection. Non-GMO, glucose free, vegetarian formulation.